Welcome to the second annual Vashon Summer Arts Fest at Vashon Center for the Arts. Calling Vashon Artists to apply for 2019 Vashon Summer Arts Fest. Deadline March 29. 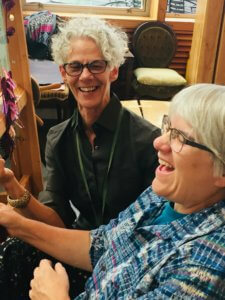 Last year we had an amazing series of shows with over 125 Vashon artists participating in 40 solo and group shows, plus weekly demonstrations and workshops. 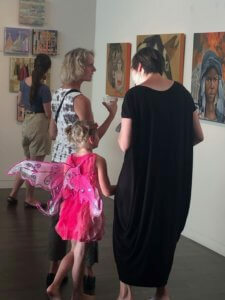 We continue this year in the spirit generated when both novice and experienced artists show their work, inspire one another, and connect around their artistry. Vashon art patrons and Island visitors saw the breadth and depth of the Vashon artist community. This year we will continue to foster community with an even more participatory event by engaging the artists in the installations and gallery openings. Vashon Center for the Arts provides the venue and production support, but Arts Fest’s heart is sustained by the active contributions of the artists in all aspects of the event. This year we are calling in the artists to curate, hang, and promote their shows. This is a community event for and with the Vashon artist community. Arts Fest shows Vashon artists only. We are accepting applications for solo shows and group shows. 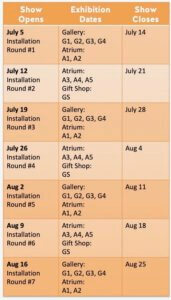 There are 10 exhibition areas. Each exhibit is up 10 days, inclusive of two weekends. There are new installations each week with Art Opening parties each Friday. Artists are responsible (or designate someone else) for hanging their own show, with VCA guidance and supplies. Artists are responsible for picking up art the Monday following their closing weekend. Demonstrations and workshops will take place on Saturday during July & August some time between 12-5pm. All events are drop in (no pre-registration required). All events will be in the Atrium or Patio. Be sure to fill out the application completely so that we have all the information to make our decisions. We thank you for your interest and look forward to seeing what artistry you are contributing. 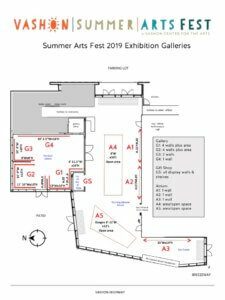 Thank you for your interest in participating in the 2019 Summer Arts Fest at Vashon Center for the Arts, July 5 – August 25. Please click the appropriate button to submit your proposal.